This is a placeholder. I need a theme idea. I'm following along. I'll check back in when I figure out my theme. Thanks! I put some ice climbing stuff up for you in my old one too! Thanks. I'm having some trouble coming up with things, honestly. If you look at my post-challenge log on my previous challenge, you'll see biking the whole way to work is becoming "interesting." I may try to switch to 3 days a week at the gym if the combination of rapid belly growth and icy roads continues to foil me. This Wednesday (today) marked the end of week 26, which means somewhere between now and next Wednesday marks the start of the third trimester. (Today if you think it's going to be 39 weeks, next Wed if it's going to be 40+.) A thing I read today said I should expect my belly to grow 1/2" a week from here out. *whimper* ouch. Doing bodyweight shoulder exercises at home hasn't been super successful. Going TO the gym gets me much more motivated, whereas home is a place for cooking and sleeping. And puttering. I really get sucked into puttering. Our basement project will be chugging along this challenge, so by the end of it we should nearly have our crack climbing rig hanging in the ceiling. That will change things. I really hate having me and MFH drive separate cars to work, but it looks like this may slip as the long rides become less frequent. He's also feeling pressed to get some good hours in now so he can be more flexible later. I would love some theme advice. I want to be super enthused about choosing new goals, but I don't want to beat myself up and make things mentally harder if I fall short. I've never been pregnant before, don't know what to expect, and am notoriously hard on myself. I also have had a lot of mood problems throughout. That's why I hopped back on here in the first place. I would love some theme advice. Being enthusiastic about the goals is really a matter of adjusting your perspective and expectations to the reality of your circumstances. Just going off what I saw in your last challenge, it seems like you want to stay as active as you can as you go through this process. The real challenge of that is that the things you're able to do are going to change as time goes on. As you have already found out, there's no good information anywhere about how pregnancy affects athletic ability, so you are your own pioneer into very uncharted territory. Having said all that, all I can really tell you is what has worked for me, and if some of my experience can translate to your situation, then maybe it will help you. The limitation I'm dealing with right now is time. I can't consistently do the kind of weight lifting that it takes to gain strength, so it would be meaningless for me to set a strength training goal. This really bummed me out for a while. When I finally realized that anything is better than nothing, I looked at what I could squeeze into my insanely busy schedule. I can do some KB and bodyweight stuff, and take a long walk a couple times a week. So my goal is to maintain some consistency in doing what I'm able to do. Now, to be honest it's not easy to be enthusiastic about pushups and air squats. I know I'm not getting any stronger doing them. But, I am keeping some basic fitness in my muscles and joints, and getting my heartrate up now and then. And that's going to make it easier to get back under the bar once I graduate and I've got some time again. So I'm enthusiastic about having found something that I can do, and living the best life I can. It's not a lot, but it's enough to go on. OK. We have a THEME! After all the Momoa and Hemsworth-ing over at @Rurik Harrgath's thread, I got the bug. The women of Wonder Woman are amazing, and Crossfit continues to provide amazing inspirational pregnancy youtube videos. But I need a hero. Thor it is Especially Chris Hemsworth's Thor. 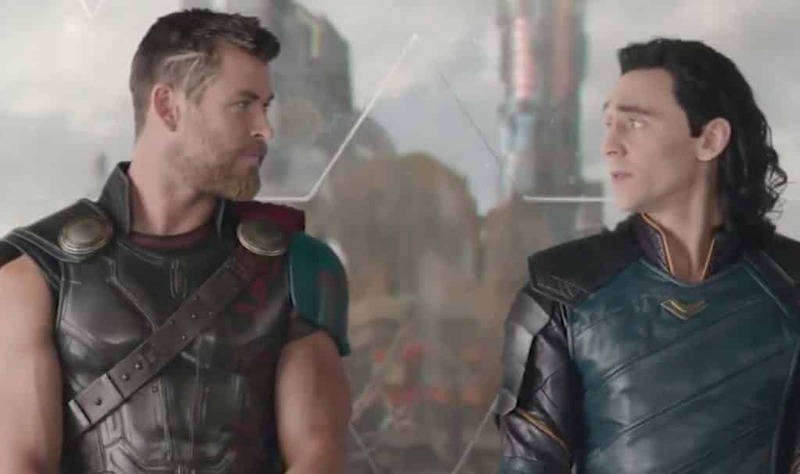 He and Tom Hiddleston break the 4th wall and have such great rapport in the movies - definitely my favorite Marvel movies. And the Ragnarok soundtrack is just the latest in a bunch of stoke-inducing scores. Loki is in here too. I need to watch out for my inner Loki. I need to stay out of my head and watch out for obsessive circular thinking when I'm feeling overwhelmed. So, the general question for me to ask throughout this challenge is "What would Thor do?" Yes, I realize the comparison can't go too far. I'm a 5'7" pregnant woman who works full time, but still. The question is worth asking. This challenge will take me from week 26.5 to week 30.5. A time during which, apparently (according to the internet) my belly may grow 1/2" a week. This video, at minute 3:30-ish mentions the problem with that: My abs are strong. They were great. They hurt when my passenger gets bigger and pushes on them. A lot. This makes things very uncomfortable at the end of the day whether I've exercised or not. So what WOULD Thor do? Chris Hemsworth is a nice guy. He has 3 kids. He works out a lot. There must be a way to work it all out. Goal 1 Work out 5 days a week: Biking to work is getting harder. Ice and the length of the ride (and associated round ligament + oblique pain) are posing serious obstacles. But Thor, Earth Thor at least, trains 5-6 days a week. So allowing for one rest day during the week and one rest/house project day on the weekend, I'm going to work out one way or another 5 days a week. This means that days I don't go to the climbing gym with MFH, I will go on my own. The aim is to lift heavy 2-3 days a week and the other 2-3 days come up with some sort of circuit training that keeps me mobile, strong, and happy. Possible points: 5 per week. Goal 2 Master the mind and keep the stoke: When things hurt I get discouraged. I don't know what I could be doing better. If I sit and rest for 2 days I get so stiff and the internal pressure from rapidly growing inmate hurts a lot. If I exercise, there are still twinges, but I'm in a better mood. Until I get too tired. Just much. too. tired. A day of discomfort brings on the mind demons. I start rehashing our finances in my head. My "to do" list. Our health insurance. Everything. Over and over. It's not helpful. It still makes me irritable around MFH even though it IS better. I need to refocus. To stay "in my body" or at least in the present even if it's not comfortable. There's a yoga term for this that I can't remember, sitting with the uncomfortable place. It's Thor knowing Loki well enough to predict when he's going for the double cross. Gotta keep that awesome soundtrack running. Welcome to the jungle. Possible points: 7 per week. One for every day that I don't crash mentally. Goal 3 Drink [water] like a Viking: I've been pretty bad at this. It's dry out and water is becoming more important. 2 Nalgenes a day is the baseline. Bonus points for 3. Possible points: 1 per day plus an extra 1/2 pt for the 3rd. Goal 4 Be mindful of my alignment: This isn't really a Thor thing. It's more a "I'm going to have a baby soon" thing. The strength training is great, but I need to keep my alignment and mobility up too. My lower back doesn't hurt. There's a lot of muscle there. And I can squat. But I need to keep my pelvic floor not only strong but able to relax. I need to find ways to stretch out aches and pains as they come without stressing things that shouldn't be stressed. There are some breathing exercises to do that I have been using to check in with my core already. Maybe some yoga poses. I'm not sure how to score this, but we'll say 1 pt for every day I do basic poses and breathing exercises to keep things from getting locked up. Possible points: 7 per week. One for every day. I really don't know what my body is going to be acting like at the end of this month. My first task for the end of this week is to come up with a circuit for those non-bike commute days where I'm training alone. I love this challenge theme so much. oh COOL! I wonder how AWESOME it would be too lift Thor's Hammer!? As for mood swings.....those peaky hormones during pregnancy wreak havoc with emotions and moods. I was a crier. Everything made me overly emotional. Add in my Holiday tears (I’m a schmuck for sentimental stuff during the holidays, and stupid crap gets me going, AND I was preggers during Christmas) and my people avoided me. But it will pass. I'm due sometime in May. The nalgene thing I know I need more than 2, but getting it in at work is something I'm pretty bad at. I got 24 oz of water this morning before running errands, but yeah, it needs some work. So: week 0 round up. I had the beginning of my week 0 log in the end of my old challenge. Thursday: another rest day. Derp. Friday: This was Winter Bike to Work Day. We got a lot of snow Wednesday afternoon, and it was -7 in the morning, so MFH and I didn't ride the whole thing. It would have been 8.5 mi to work for me and 14 for him each way, and I haven't ridden both ways in a while. And there was a lot of ice. So we drove into town, ditched the car, and rode to the bike co-op to hang out for a minute. Then we rode our separate ways to work and met back at my job in the evening to go get the car. My total mileage on the day was probably 6-7 mi. I'll take it. On hills I still had the ab muscles out by my hip bone knotting up and seriously slowing me down. Saturday: I was pretty lumpy. It was supposed to be house project day. We got a late start going to the hardware store, and I got a small rest in before we tag teamed the big table saw part of the project. All in all I'm pretty tired. The tummy demon has grown mightily this month and everything is getting yanked on. SUNDAY: Sunday was awesome. And then I screwed up. Sunday we took the skiis out to a new area. It was great! Narrower than fire roads, but not too narrow of a trail. A lot of ups and downs, but nothing too too steep. And almost no people compared to where we usually ski. We logged 7 mi. I had one crash that wasn't so great - I intentionally bailed into a snow bank after a berm kicked one of my skis and launched me way too fast. My body landed in a comfy pillow, but my right leg twisted around in one of those "why is that ok?" type of positions. I had to continue to descend immediately after that though, and I got some new skills figured out and was not derailed by a berm again. My legs were shelled at the end, but it was pretty great. And then I screwed up. We went home. I had pizza. And took a bath. I got too hot even thought I was only halfway in the water, and then discovered via horrible muscle cramps that I was way way dehydrated. Not so great. I had water while skiing but not enough. My lower abs were stiff to begin with and drinking made me feel like I needed to stop all the time so.... eh. Add to that I wasn't working too too hard and it was cold out. Next week I'm splitting my water between my nalgene and a camelbak - the hose might freeze, but I need to try to get myself to sip more. MFH kept me company. Helped me get from the bathroom floor to bed. Grabbed me 64 oz of water and eventually a cup of miso soup - because I needed to salt to keep the water in my body. My little passenger burbled along just fine, but every muscle in my core and around my stomach was cramping badly. It was a rude multi-hour lesson that I will not be repeating. Today we carpooled in. I have to chug a bunch of grape juice in the afternoon for my glucose challenge test - not looking forward to that. I'm totally exhausted today, but staying hydrated. I had mega comfort food for breakfast: what I'm calling "super grits" - Cheese grits with two eggs scrambled into them and an entire sliced avocado on top. More miso soup to hang on to the water I'm drinking. Dehydration is no joke, I'm glad you're okay. Supergrits sounds like something I need to have soon! 1. My suspicions when I couldn't stand up were correct. My blood pressure was likely way too low. It was only 104/69 at my appt too. 2. Duh. Drink more fluids. Maybe eat more protein. 3. My glucose levels in my voicemail this morning were perfectly normal and my iron levels were "fantastic." So when I'm tired, I'm tired not anemic. That's a thing. 5 routes including the crack lap. On the deadlift I paused between reps 3 and 4 for a couple breaths, but it felt good. I didn't have to strain or hold my breath on the last rep. If I'm turning red and not breathing, that's probably not a good idea right now. lol. I didn't go up in weight for last Tuesday because it had been a week and because the DL seemed hard last Tuesday. My second gym day this week I'll go up 5 lbs again. Theoretically preggo me is supposed to stop increasing weight at some point, but I'm watching my exertion level. When I decrease weight I'll add more side exercises. I continue to hate the pregnancy harness like the plague, so when MFH's spare harness no longer fits, I may be lifting only. Today was the first day climbing that people seemed to really notice. I've been wearing the same oversize cutoff tshirt and baggy climbing pants for like a month, but things are definitely changing. I keep trying to imagine a pregnant woman rock climbing, and brain keeps rejecting it. You might need to post a video. I keep trying to imagine a pregnant woman rock climbing, and brain keeps rejecting it. ﻿You might need to post a video. I will have to dig up some recent photos. To be fair, since December or so I've been climbing inside only (except for going to Ouray on Super Bowl weekend). I hate standing around getting cold, and the pregnancy discomforts just amplify that. Last winter we aid climbed, and there was beer and whiskey. This year it's been cross country skiing and indoor climbing (and weight lifting and still some biking). Gym climbing also let's me avoid routes that are less than vertical. If I were to follow a lower angle route now, every time my belayer pulled up rope, the knot would dig into my belly. Or, in the case of the full body harness from hell, hit me in the nose. So, top rope at the gym it is, for the moment. On my last challenge (link below) I posted some pictures of me ice climbing 1.5 weeks ago. So 25.5 weeks pregnant. I missed the pictures before. Very cool! Ok. This is for @Cheetah, @TGP (because he climbs), and @Rurik Harrgath(because Momoa climbs harder). Fuzzy photo from today. 5.10-ish gym route. Top rope, but gently, which is to say: MFH can't give me a cheat because the yanking around isn't great. Sitting back in the harness at the top of the route is fine though.